Drought-hit Kenyans Find Gold in Tea Trees - But for How Long? File - Workers pick tea leaves at a plantation in Nandi Hills, in Kenya's highlands region west of capital Nairobi. At Sweet Waters, a village in central Kenya, Veronicah Nyambura stands under the hot sun between two fields. One is full of lush plants - but the other has crops so wilted that their leaves have curled up. "Maize is very disappointing. You plant but you're never sure whether you'll harvest anything," said Nyambura, who has planted a quarter-acre of tea trees. Many farmers in this part of Laikipia County - like farmers in many parts of the world - cannot afford to buy seeds for alternative crops better suited to drought, so keep planting maize. FILE - A truck is loaded with bags of tea leaves at a plantation in Nandi Hills, in Kenya's highlands region west of capital Nairobi, Nov. 5, 2014. To meet the demands of buyers, Martin Thogoto Mwambia, 68, uses mulch - not chemical fertilizers or pesticides - on his 1.75-acre tea tree farm in Ngarariga village, in neighboring Nyeri county. "I am mulching them with cow-dung and dried leftovers of tea tree," he said with a smile while rubbing the dirt off his hands. "Handling 50,000 Kenyan shillings ($490) and sometimes 100,000 Kenyan shillings ($990) is a miracle to me. Tea tree has given me that privilege," said Mwambia, who worked as a guard in a local firm before he began growing tea trees. Prior to tea tree he grew maize - but even in good years he earned far less, he said. "Sometimes when the drought is at its worst I would harvest a tin (a kilogram) or two," said Mwambia who is now harvesting an average of 10,000 kgs of tea tree branches annually from his farm. "Life is better for us now. I am happy," said his wife, Jane Gathigia. "Marketing maize is a headache. 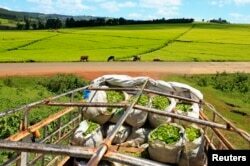 The prices fluctuate from time to time and farmers end up making losses," said Alice Wanja, 42, at her quarter-acre tea tree farm at Sweet Waters, about 1.5 km from Nyambura's home. "There is nothing like that with tea tree. The buyer is already at the waiting end and the buying price is good," she said. FILE - A youth delivers tea leaves for weighing in Nandi Hills, in Kenya's highlands region west of capital Nairobi, Nov. 5, 2014. On the flip side, the buyer is also at risk of closing shop if the farmers' productivity falls or fails completely, he said. Earthoil's project manager, Martin Wainaina, said there is such a big demand for tea tree oil that they are making aggressive plans to expand production. But "most (such) community projects ... are usually sustainable because trade goes on even after the project (ends)," she said.